Lock up your love, or go with the flow? Thanks to the recent announcement of the engagement of Prince Harry and Meghan, Markle, love is in the air. As my recent trip attests, love, or one particular symbolic representative of love, is also alive and well, and shackled to fences and railings across Europe. I’m speaking of course of “love locks” — those ubiquitous padlocks of all shapes and sizes that have been adorning iconic bridges and viaducts across the continent and spilling into North America over the past decade. 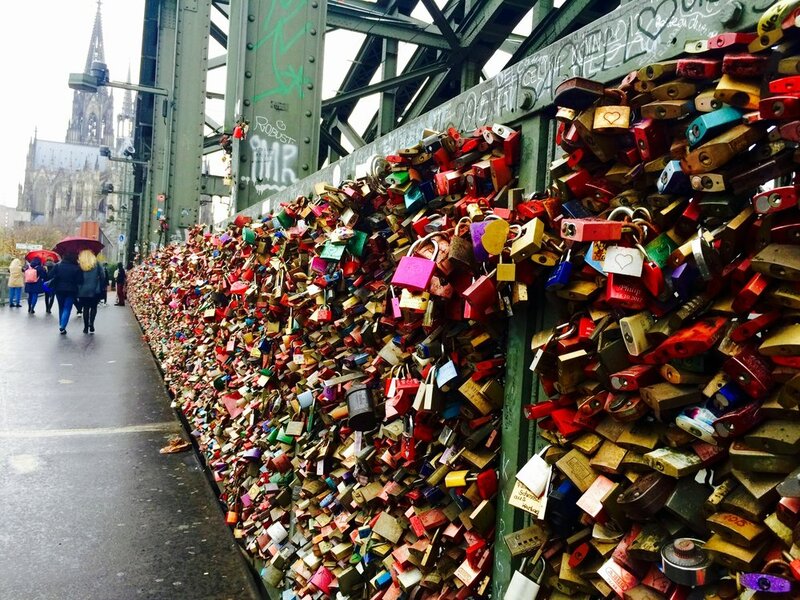 The Hohenzollernbrücke Bridge in Cologne, Germany, boasts what is surely one of the largest collection of these locks, many custom engraved and each tenderly affixed by a couple to symbolize their commitment to one another. It is a sight to behold. The kitschy, colourful collection runs alongside the fence that separates the walking path from one of the busiest over-water train crossings in Europe. I suppose that for many couples, seeing such a collection stimulates a sense of romance that sends them racing to the nearest shop to purchase a lock they can clip to the fence, throwing the key into the river below and symbolizing their everlasting love. I see it more as a fun urban art or anthropology project rather than a testament to enduring love. Granted, I wasn’t in Cologne with my partner-in-adventure-and-all-things-domestic. I was there with my mother and my son. Perhaps I wasn’t as susceptible to the appeal of the padlocks as I otherwise might have been. 1. Wow, I wonder how many of these 50,000+ couples are still together? 2. What a colossal waste of money. 3. How long will it be until these locks are removed due to risk of collapse under pressure (as they have been from the Pont des Arts over the Seine River in Paris and others)? Despite this skeptical attitude, I am truly a romantic at heart. I cry at weddings and love romantic comedies. I have even been known to idealize the occasional romantic coupling (I will be undone if Michelle and Barack’s marriage topples). I’ve been trying to understand why I have such an immediate and viscerally negative reaction to the love locks — what many people would see as a hopeful manifestation of affection. I think I’ve finally figured it out. After 30 years with the partner-in-adventure-and-all-things-domestic, I have learned a few things — most notably that the intoxicating passion we feel when we’re falling in love is fleeting. In fact, neurologists tell us we are lucky if we feel the heart racing, weak-in-the-knees symptoms of infatuation for more than 24 months. No shackle can hold it in place. If we hope to have a relationship that lasts decades, we need to approach it less like the steel clasps on those bridges and more like the fluid and shifting waters that run under them — sometimes calm, sometimes raging after a storm. Case in point: the 1,200-kilometre Rhine River that runs below the Hohenzollernbrücke Bridge. It’s been going with the flow for 5 million years. Not that they’re asking, but if they did, my advice to the newly engaged Harry and Meghan — and any recently in-love couple contemplating affixing a love lock to a bridge and looking for a happily ever after — would be this: endeavour to be more like the key you throw in the river, shifting and moving with the sands and the tides, and less like the immutable lock affixed to the railings. Am I just being paranoid?